The Compulsive Reader: Nancy Drew 80th Anniversary Giveaway! Nancy Drew 80th Anniversary Giveaway! Happy 80th Birthday, Nancy Drew! I don't know about you, but for me it's hard to believe that the Nancy Drew books have been around for only eighty years. She has become such an iconic figure in children's literature, and even if you haven't read any of the Nancy Drew books, it's safe to say that most people know the name. This month, we're commemorating the 80th anniversary of the release of the first Nancy Drew book by giving away a Nancy Drew prize pack, thanks to the generosity of Simon and Schuster! The contest will run until May 31st, 2010! 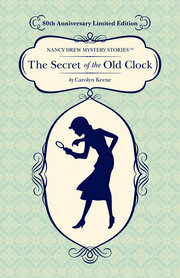 Want more Nancy Drew? Visit NancyDrewDetective.com, or click here to become a fan on Facebook! especially the computer games haha! Thanks for the chance to win this! I have to admit that Nancy Drew was a big part of my childhood. Oh. My. God. I want this SO bad. You have no idea. Thanks for a fab contest! I used to play the Nancy Drew computer games ALL the time. And I've read all the books =]. My mom has them all from when she was a kid. Oh my gosh. This would be perfect for my sister. She loves Nancy Drew! Win a Glass Slipper from The Cinderella Society! Shade by Jeri Smith-Ready: Read It and Win It!